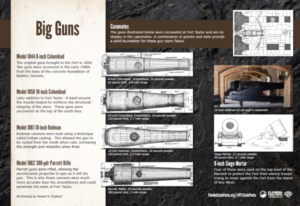 Certainly the most popular attraction at Fort Taylor is the display of big guns in the North Curtain. All of these guns are original Fort Taylor artillery pieces from the Civil War. They represent some of the almost 200 artillery pieces used either in the Fort or in adjacent shore batteries on the island. The display includes 8-inch Model 1844 Columbiad smoothbore cannons, 10-inch Model 1858 Columbiad smoothbore cannons, 10-inch Model 1861 Rodman Columbiad smoothbore cannons, and the mighty 300-pound Model 1861 Parrott Rifle. The 8-inch Columbiads were the first weapons deployed to the Fort followed by the 10-inch Columbiads. An additional weapon, the 8-inch Model 1840 Sea Coast Mortar pictured on the bottom right of the marker, is currently displayed in the Sally Port. Future additions are planned for the Big Guns outdoor display area. Early in the Civil War, the Army added a number of 10-inch Rodmans to the Fort’s complement. Toward the end of hostilities, the 300-pound, 100-pound, and 30-pound Parrott Rifles were brought into Key West. While none of the 30- or 100-pound tubes have been found, they were definitely on the gun list for the Fort. Also, significant amounts of ammunition for both size weapons were uncovered in the excavations in the early 1970’s. The largest guns installed in the Fort were several 15-inch Model 1861 Rodman Columbiads. Although none have been found so far within the Fort, the presence of a ready stack of 11 of 15-inch balls as you enter the Fort proves that they are here. One of the true treasures in the Big Guns display area is the casemate-mounted 10-inch Rodman in Room 43. While the chassis and carriage are replicas made of modern steel to Civil War dimensions, the gun tube is authentic. The replica chassis and carriage were designed by Howard England using measurements he made from original Civil War equipment found at Fort Taylor. Closer examination of the gun mount gives an idea of the scale of the coastal artillery employed at Fort Taylor and many other fortifications in the United States.